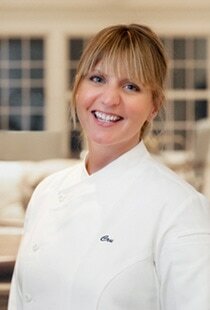 Erin is executive chef and a partner at Cru. Her cuisine is simple and innovative, influenced by her classical French training and Mediterranean sensibilities, presenting a fresh interpretation of New England seafood classics. Prior to founding Cru, Erin spent seven years as chef de cuisine at the acclaimed Boarding House restaurant in Nantucket where she created seasonal farm-to-table menus that incorporated a Mediterranean inspired cuisine. During the past several years, she has enhanced her skills through culinary trips to Morocco and the Andalusia region of Spain, Sicily and the Calabria region of Italy, and Istanbul, Turkey. Erin spent time in the kitchens of Lucques and AOC restaurants in West Hollywood, California. Her classic French training was earned after a year in Brest, France at the highly rated La Fleur de Sel and Ma Petite Folie restaurants. Earlier in Erin's career, she worked at the noted James Beard Award winning restaurant Oleana where she received extensive training in Mediterranean cuisine. She launched her career at the award-winning Chicago landmark restaurant The Everest as an assistant saucier and was trained in Alsatian inspired French cuisine. Eight years ago, Erin moved to Nantucket for a summer job and never left. In her free time, Erin enjoys walking at Sanford Farms, kayaking and fishing. She is a picnic connoisseur and can often be found at the beach with her friends grilling fresh-caught fish and making side dishes with locally picked produce. Erin's culinary skills have been featured in the Wine Spectator, Zagat's, Fodor's, Rachel Ray, Nantucket Today, Cooking Channel and Boston.com. She is a graduate of the New England Culinary Institute.